This morning following the result in the Referendum on Independence in Scotland, The Rt Hon David Cameron MP, First Lord of the Treasury, (and Prime Minister) made a statement in Downing Street. My comments to what he has said are in red and italics below. “The people of Scotland have spoken. It is a clear result. They have kept our country of four nations together. Like millions of other people, I am delighted. The people of Scotland have voted no to independence. It is a clear vote that they do not want independence. “As I said during the campaign, it would have broken my heart to see our the United Kingdom come to an end. Surely it is not “our United Kingdom” unless you are HM The Queen. “And I know that sentiment was shared by people, not just across our country, but also around the world…. because of what we’ve achieved together in the past and what we can do together in the future. “So now it is time for our the United Kingdom to come together, and to move forward. He means “the United Kingdom” again. “A vital part of that will be a balanced settlement – fair to people in Scotland and importantly to everyone in England, Wales and Northern Ireland as well. “Let us first remember why we had this debate – and why it was right to do so. “The Scottish National Party was elected in Scotland in 2011 and promised a referendum on independence. “We could have blocked that, we could have put it off but just as with other big issues, it was right to take – not duck – the big decision. “I am a passionate believer in our United Kingdom – I wanted more than anything for our the United Kingdom to stay together. “But I am also a democrat. And it was right that we respected the SNP’s majority in Holyrood and gave the Scottish people their right to have their say. “Let us also remember why it was right to ask the definitive question, Yes or No. “Because now the debate has been settled for a generation or as Alex Salmond has said, perhaps for a lifetime. “So there can be no disputes, no re-runs – we have heard the settled will of the Scottish people. “Scotland voted for a stronger Scottish Parliament backed by the strength and security of the United Kingdom and I want to congratulate the No campaign for that – for showing people that our nations really are better together. So the answer “No” can only be said to say that the Scottish electorate do not want Scotland to be an independent country. No other extrapolations are possible. There was no question about so-called devo-max on the ballot paper. We cannot know that that is what the electorate of Scotland wants. “I also want to pay tribute to Yes Scotland for a well-fought campaign and to say to all those who did vote for independence: ‘we hear you’. “We now have a chance – a great opportunity – to change the way the British people are governed, and change it for the better. “Political leaders on all sides of the debate now bear a heavy responsibility to come together and work constructively to advance the interests of people in Scotland, as well as those in England, Wales and Northern Ireland, for each and every citizen of our the United Kingdom. “To those in Scotland sceptical of the constitutional promises made, let me say this we have delivered on devolution under this Government, and we will do so again in the next Parliament. Here is the crux of the problem. Mr Cameron is attempting to suggest that he knows exactly what the next Parliament of the United Kingdom will do. Is he a mind reader? Or a clairvoyant? With 229 days until the next Parliament is elected, can he be so sure of the result thereof. “The three pro-union parties have made commitments, clear commitments, on further powers for the Scottish Parliament. Some politicians have made commitments. They are from three parties. Whether each of these parties have actually made commitments is another question. “We will ensure that they are honoured in full. 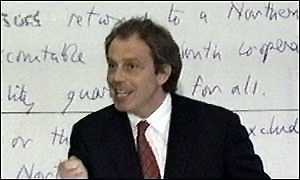 Tony Blair made a handwritten pledge to the people of Northern Ireland in 1998. How can he say that? He has already said that it is for the next Parliament. He may not be an MP in the next Parliament. The current Coalition Government may not be in power. There may be a spectacular rise in the UKIP vote. He is making promises that he would like to be able to keep, but he cannot be sure that he can.We should bear in mind that the people of Northern Ireland were made pledges (even signed symbolically) by a certain Rt Hon Tony Blair were simply personal pledges not ones that could be enforced. “And I can announce today that Lord Smith of Kelvin – who so successfully led Glasgow’s Commonwealth Games – has agreed to oversee the process to take forward the devolution commitments with powers over tax, spending and welfare all agreed by November and draft legislation published by January. “Just as the people of Scotland will have more power over their affairs, so it follows that the people of England, Wales and Northern Ireland must have a bigger say over theirs. “The rights of these voters need to be respected, preserved and enhanced as well. “It is absolutely right that a new and fair settlement for Scotland should be accompanied by a new and fair settlement that applies to all parts of our the United Kingdom. “In Wales, there are proposals to give the Welsh Government and Assembly more powers. “And I want Wales to be at the heart of the debate on how to make our United Kingdom work for all our nations. “In Northern Ireland, we must work to ensure that the devolved institutions function effectively. “I have long believed that a crucial part missing from this national discussion is England. “We have heard the voice of Scotland – and now the millions of voices of England must also be heard. “The question of English votes for English laws – the so-called West Lothian question -requires a decisive answer. “So, just as Scotland will vote separately in the Scottish Parliament on their issues of tax, spending and welfare so too England, as well as Wales and Northern Ireland, should be able to vote on these issues and all this must take place in tandem with, and at the same pace as, the settlement for Scotland. “I hope that is going to take place on a cross-party basis. I have asked William Hague to draw up these plans. “I hope the Labour Party and other parties will contribute. So will we see a Parliament or Assembly for England? This seems to be the logical extension of what he has said. This sounds much more like Liberal Democrat policy than that of the Conservatives. We seem to be moving towards a Federal system. But to do this – we will need to actually talk as a whole United Kingdom. And move away from Westminster “devolving power” on the nations to the nations agreeing that the “Union Parliament” legislates on certain issues. “It is also important we have wider civic engagement about to improve governance in our the United Kingdom, including how to empower our great cities. And we will say more about this in the coming days. So, he has more ideas about civic engagement – might it be a good idea to put these to the electorate at some point? That is in the whole of the United Kingdom (not simply basing everything on one vote on one issue in Scotland). It would be great also if we could get all parties standing in all parts of the UK too of course. “This referendum has been hard fought. It has stirred strong passions. It has electrified politics in Scotland, and caught the imagination of people across the whole of our United Kingdom. “It will be remembered as a powerful demonstration of the strength and vitality of our ancient democracy. “Record numbers registered to vote and record numbers cast their vote. We can all be proud of that. “It has reminded us how fortunate we are that we are able to settle these [this] vital issues at the ballot box, peacefully and calmly. Only one issue has been settled. That the people of Scotland do not want Scotland to be an independent country. Seems he only wants the people of Scotland to come together – as only they had a vote in the Referendum. Or perhaps he meant to leave out “whichever way they voted”. This post was originally posted at Gyronny Herald.